"We think the moon is in a general state of global contraction because of cooling of a still hot interior," said Thomas Watters of the Center for Earth and Planetary Studies at the Smithsonian's National Air and Space Museum in Washington, and lead author of a paper on this research appearing in the March issue of the journal Nature Geoscience. "The graben tell us forces acting to shrink the moon were overcome in places by forces acting to pull it apart. This means the contractional forces shrinking the moon cannot be large, or the small graben might never form." The weak contraction suggests that the moon, unlike the terrestrial planets, did not completely melt in the very early stages of its evolution. Rather, observations support an alternative view that only the moon's exterior initially melted forming an ocean of molten rock. In August 2010, the team used LROC images to identify physical signs of contraction on the lunar surface, in the form of lobe-shaped cliffs known as lobate scarps. The scarps are evidence the moon shrank globally in the geologically recent past and might still be shrinking today. 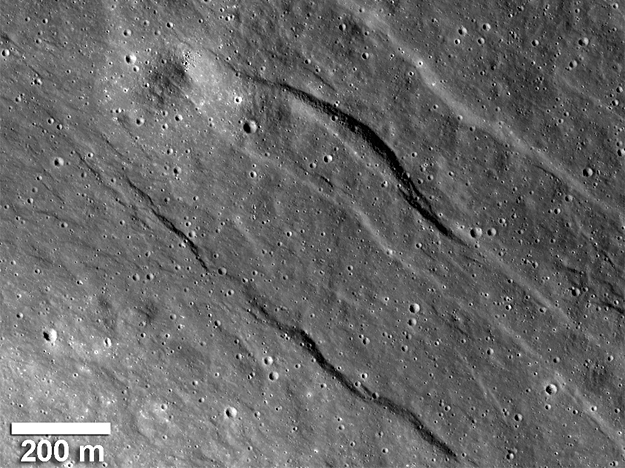 The team saw these scarps widely distributed across the moon and concluded it was shrinking as the interior slowly cooled. Based on the size of the scarps, it is estimated that the distance between the moon's center and its surface shrank by approximately 300 feet. The graben were an unexpected discovery and the images provide contradictory evidence that the regions of the lunar crust are also being pulled apart. "This pulling apart tells us the moon is still active," said Richard Vondrak, LRO Project Scientist at NASA's Goddard Space Flight Center in Greenbelt, Md. "LRO gives us a detailed look at that process." As the LRO mission progresses and coverage increases, scientists will have a better picture of how common these young graben are and what other types of tectonic features are nearby. The graben systems the team finds may help scientists refine the state of stress in the lunar crust. "It was a big surprise when I spotted graben in the far side highlands," said co-author Mark Robinson of the School of Earth and Space Exploration at Arizona State University, principal investigator of LROC. "I immediately targeted the area for high-resolution stereo images so we could create a three-dimensional view of the graben. It's exciting when you discover something totally unexpected and only about half the lunar surface has been imaged in high resolution. There is much more of the moon to be explored." The research was funded by the LRO mission, currently under NASA's Science Mission Directorate at NASA Headquarters in Washington. LRO is managed by NASA's Goddard Space Flight Center in Greenbelt, Md.